Chaitra Navratri 2018 Day 3: On the third day of Chaitra Navratri, goddess Changraghanta is worshipped by her devotees. The 3rd incarnation of Maa Durga is worshipped on Tritiya Tithi which will fall on March 20 this year. This year Chaitra Navratri will be lauded from March 18 to March 25. Devotees from across the world celebrate the 9 days with love, peace, devotion and harmony. On the third day of Chaitra Navratri, goddess Changraghanta is worshipped by her devotees. The 3rd incarnation of Maa Durga is worshipped on Tritiya Tithi which will fall on March 20 this year. 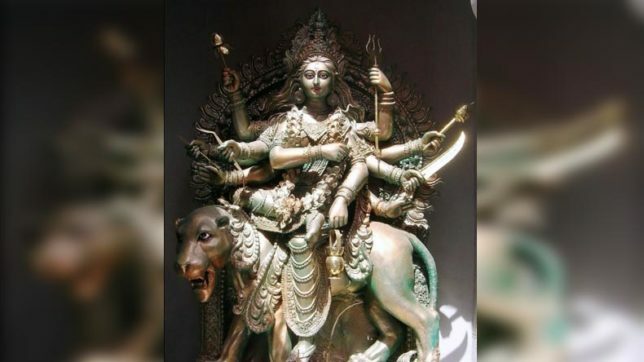 After worshipping Maa Shailaputri and Maa Brahmacharini, every year devotees worship Changraghanta also known as Chandika, Chandrakhanda or Rannchandi and is known for her courage, peace, and bravery. The word Chandra means half moon whereas Ghanta means bell. It is believed that Mata had half-moon shaped crown on her head and a third eye which stays open. Maa Chandraghanta who was the incarnation of married Parvati requested Lord Shiva to arrive in the form of a prince when he came to he arrived with ghosts and aghoris to take her. Parvati maa’s family and guests were terrified to see this form of Shiva but she revived the memories if them. Hence, Devi Chandraghanta is worshipped for forgiveness and peace. During the prayer, Mantra “Ya Devi Sarvabhooteshu, Maa Chandraghanta Rupen Sansthita| Namastasyai Namastasyai Namastasyai, Namo Namah|| Pindah Pravarudha Chandkopastrakayurta | Prasand Tnute Mahayam, Chandraghanteti Vishruta||” are recited to seek the blessings of Maa Chandraghanta. The pujan starts with worshiping all god and goddess in the kalash which is followed up by offering prayers to Lord Ganesh and Durga Maa’s entire family. Maa Chandraghanta is worshipped at the end, soon after worshipping the incarnation of Maa parvati, lord Shiva and Brahma are worshipped.